The Twilight Sword has been forged, the Casket of Ancient Winters has been opened, and the forces of Asgard are gathering as the second volume of Thor Visionaries: Walter Simonson begins. Odin pulls out all the stops to build up his army, beyond the usual forces like the Warriors Three. For instance, he brings in Harokin, an early villain-turned-hero and Thor doppelganger, and the Enchantress and Skurge the Executioner volunteer. There’s even a cameo from Eilif the Last Viking, whose story was chronicled in the previous volume. Great effort is spent trying to recruit Loki, who finally aids his father and brother at the last minute. Of course, Odin brings back his greatest resources: Beta Ray Bill and Sif, who have spent the last few issues off in space on an adventure that’s never really been chronicled. During the epic war against Surtur and his forces, Bill is surprisingly over-protective of Sif -- perhaps Simonson’s first indication that, while they make good friends, they may not be the best of romantic partners. Asgard’s queen, Frigga, and the younger children of its inhabitants are sent away for their own protection, and their antics provide some comic relief. On Earth, Thor, Bill and their allies team up with the Fantastic Four and the Avengers, working with them to topple the demons’ invasion gate and repair the Casket of Ancient Winters. In a unique cross-promotion, all of the titles in the summer of 1986 featured unusually cold weather; Kitty comments on it in Kitty Pryde and Wolverine. 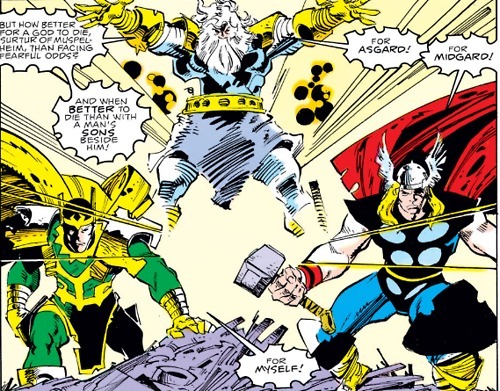 One of the strongest storytelling elements Simonson brought to The Mighty Thor was an intensive use of actual Norse mythology, which he then manipulates for his own purposes. The steps of Ragnarok laid out in the Norse Eddas are followed closely, such as Heimdall blowing the Gjallarhorn to summon Thor and Sif back to Asgard. At the same time, Odin tells the tale of when his brothers, Vili and Ve, merged with him to create a super-being capable of defeating Surtur. This sounds like a plausible bit of Norse myth and represents how those two minor gods had their duties “merged” with Odin. What’s really impressive is that there are even more subplots I haven’t mentioned, like the Human Torch/Roger Willis team-up, Lorelei’s continuing attempt to make Thor her love slave, or Bill’s solo adventure against the Titanium Man. After Odin’s apparent death, the next major villain steps in: Hela, ruler of Asgard’s realm of souls, who wants to collect Odin’s essence. The reality of Odin’s death -- and Thor’s survivor’s guilt -- takes up much of the second half of the book, but there’s always the seed in the reader’s mind that he’s not quite dead if Hela is still looking for him. Unfortunately, during the defeat of Surtur, the Rainbow Bridge was broken, stranding the Asgardian forces on Earth for a few issues. This is the first time that the Warriors Three ever clicked for me, especially Volstagg, whose cowardly character traits are dropped while his boastfulness increases. Ray Stevenson did a fine job of Volstagg in the Thor film, but with the way Simonson draws him, only extensive special effects could bring him accurately to life on the screen. Fandral the Dashing helps wrap up the disappearance of Donald Blake by paying off Blake's staff in golden coins, and Hogun the Grim scares a little boy who happens to be Jack Power of the Power Pack. Simonson never identifies the Pack in the issue, but the Warriors Three guest-starred in their book at that time, and since they were created by Louise Simonson, the two titles had a link for years. Meanwhile, Beta Ray Bill and Sif take their own tour of New York City, leading to the memorable sight of Bill in Groucho glasses. Here’s the interesting thing about Simonson's art: it’s actually the key to understanding the '90s style of artwork, especially the art of Rob Liefeld. You’ll occasionally see a lack of backgrounds, wonky proportions, overuses of lines, and sufferers of Liefeld’s Disease, wherein their eyes are drawn so that they look shut. 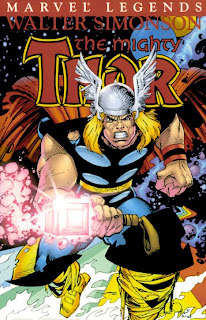 Even on the cover of issue #350, Thor’s left thigh is connected to his lower leg at an odd angle. However, here’s the difference between Simonson and Liefeld: Simonson wrote, penciled and inked the majority of his run on The Mighty Thor, whereas Liefeld usually pencils only. 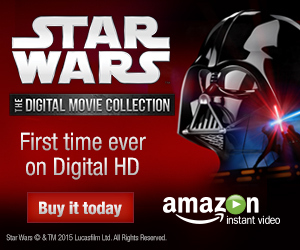 In my eye, that allows you to take some shortcuts in the service of the greater story. Simonson also has a much better sense of proportion, action and character design than many artists. Near the end of Thor Visionaries: Walt Simonson Vol. 2, Thor meets with a mysterious, Tom Bombadil-esque stranger who helps him overcome some of the grief he feels over Odin’s death. The man -- secretly his great-grandfather, Tiwaz -- quotes King Solomon’s words from Kohelet: “To every thing, there is a season, and a time to every purpose under Heaven.” That a Norse god can quote a Jewish king (and the Byrds) and not feel out of place is a testament to the strength of Simonson’s epic. It’s the perfect summation of Norse mythology’s cyclical nature; in the next volume, things only get more dire for Thor and Asgard.